Dhaka/Cox’s Bazar, Jul 17 2018 - Almost a million Rohingya refugees in Bangladesh face a triple threat of extreme weather, funding shortfalls and uncertainty about their future, William Lacy Swing, head of the UN Migration Agency, IOM, said today. He made the remarks after reviewing progress by IOM and partners in managing the world’s largest refugee settlement in Cox’s Bazar discussions with Bangladesh’s Prime Minister Sheikh Hasina in Dhaka and an earlier meeting on Thursday with Myanmar’s State Counsellor Aung San Suu Kyi. She also underscored the enormity of the impact that so many refugees are having on the local population and the need for global solidarity to find a solution to their plight and humanitarian aid to support them and the surrounding host communities. Ambassador Swing previously visited Cox’s Bazar in October 2017, less than three months into a violent crisis which has sent more than 700,000 people fleeing over the border from Myanmar since late August 2017. The Rohingya now live in desperately cramped conditions on bare sandy slopes, with only bamboo and tarpaulin shelters to protect them from the elements. All this in an area that suffers two cyclone seasons yearly and some of the heaviest monsoon conditions in the world. Ambassador Swing noted the major improvements to the camps’ management and infrastructure carried out by IOM, and an entire spectrum of other UN agencies, NGOs as well as other organizations and the government, including access ways, bridges, drainage, sanitation and improved shelters. However, as monsoon rains turned many hillsides to mud, Ambassador Swing warned that with just one quarter of joint funding appeal for the entire response met so far, much of the progress made in recent months was at serious risk of collapsing. That, he said, would create yet another life-threatening disaster for the Rohingya community. Ambassador Swing, who met young mothers from the refugee and local Bangladeshi host community who had recently given birth at an IOM medical facility in the heart of the sprawling mega-camp stressed the vital role that such health services played for people in Cox’s Bazar whether refugee or local residents. “Everyone must recognize, in addition to the refugees’ needs, the tremendous impact this crisis is having on the host community,” he said. 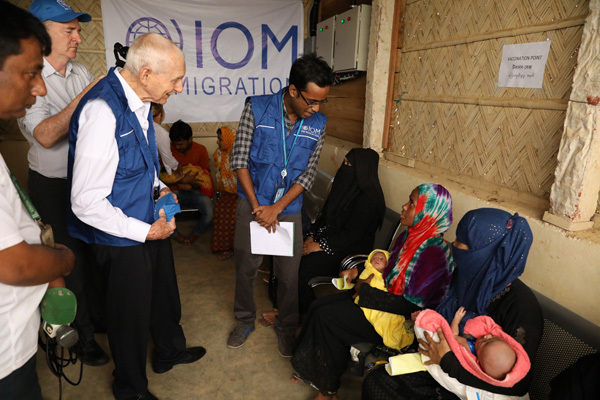 IOM has been working in Cox’s Bazar providing medical care to the local community long before the crisis which began last August, he noted. Ambassador Swing praised the great hospitality of the local community and the government and people of Bangladesh as a whole in supporting the Rohingya refugees in what is now one of the world’s largest humanitarian responses.